Home» AP LATEST UPDATES » AP Inspire Awards 2017-2018 Results/Selected Candidates list District/School wise. AP Inspire Awards 2017-2018 Results/Selected Candidates list District/School wise. 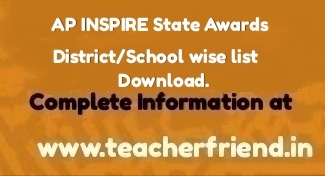 AP INSPIRE State Awards 2017-2018 Resultd Selected Candidates list District School wise list Download/AP INSPIRE State Awards Kurnool /Anantapur/Chittoor/YSR Kadapa/East Godavari/West Godavari/ Krishna/Prakasam/Guntur/Vishaka Patanam/Nellore/Srikakulam/Vijaya Nagaram District wise INSPIRE Awards Selected Candidates list Download. In so far as INSPIRE Award component is concerned, Fourteen Lakh Thirty Eight Thousand Three Hundred and Twenty Two INSPIRE Awards have been sanctioned till date Annexure . Under the INSPIRE Internship, as on date about 800 Science Camps have been held covering about 1.90 lakh students in the age group of 16-17 years, 40 Nobel Laureates and about 8000 resource persons participated in these camps. About 28000 scholarships for students in the age group of 17-22 years have been given and about 2900 INSPIRE Fellows in the age group of 22 -27 years have been enrolled so far. Finally, under the Faculty Award for Assured Career, 378 individuals have been awarded inspire faculty fellowship for initiating research work in various universities/ academic institutions/ laboratories in the country. The first component, viz INSPIRE Award, is implemented centrally through the States/UTs. Under this scheme, during the five year period two students are selected from each school of the country for an INSPIRE Award of Rs.5000/- each for preparing a Science Project / Model. These awardees, who are students from classes 6th to 10th, then participate in a three tier competition: District, State and National Level. The projects exhibited are evaluated by a jury of experts. All the 28 states and 7 UTs are participating in the scheme. The scheme will continue in the 12th Five year Plan. NLEPC: National Level Exhibition and Project Competition.